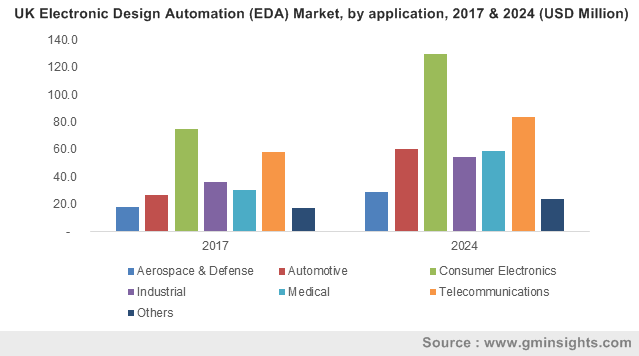 Electronic Design Automation (EDA) Market size was valued at around USD 8.5 billion in 2016 and will grow at a CAGR of over 6% from 2017 to 2024. In the electronic industry, several designers and manufacturers are using EDA tools to design and examine semiconductor devices. The adoption of EDA tools is leading to a reduction in cost, errors, and design time owing to which the industry is witnessing a growing demand for these tools from automotive, consumer electronics and aerospace, and defense sectors. Growing adoption of SoC and a high demand for smart wearable devices, such as smart thermostats, smartwatches, fitness bands, and pet wearable devices, are the key factors driving the EDA market growth. Growth in the field of cloud computing and IoT is a major factor driving the EDA market growth. The tools are being developed by companies to expand the potential of the connected devices, fueled by innovations in the semiconductor, electronic, and software industries. Several electronic manufacturers are combining components on a single System-on-Chip (SoC), which requires highly complex chip designs, a prevalent industry trend. In addition, semiconductor manufacturers are adopting the miniaturization trend by offering its customers flexible chip mounting possibilities, reduction in semiconductor size, and integration of numerous functionalities into a single set, providing an impetus to the market growth. A key challenge in the EDA market is the uncertainty surrounding the strength of the economic recovery in several regions. The weakness in the global economy has adversely affected the semiconductor industry growth in the last couple of years, causing several semiconductor companies to act cautiously and emphasize on reducing their costs related to R&D budgets, manufacturing, and by reducing their spending on electronic design services and products. However, with the strengthening global economy, the market outlook over the forecast timespan is inclined to experience an upward growth. In 2016, the EDA market witnessed the applications of Semiconductor Intellectual Property (SIP) segment, mainly in the consumer electronics market, which is predicted to continue over the forecast timespan. This is due to the rise in the adoption of consumer electronic devices such as laptops, wearable devices, tablets, and smartphones. The development of smart devices necessitates an extensive R&D and results in an increase in the complexity of the chip design, leading to the adoption of SIP as consumer electronics manufacturers are mainly focusing on providing its customers high performance with limited chip sizes. Moreover, the rise in the number of smart devices has led to the development of innovative technologies. Technological evolutions, such as the rollout of 4G/LTE networks and IoT, are providing an impetus to the SIP market growth. End users in the telecommunication industry are telecommunication service providers, network equipment manufacturers, mobile device manufacturers, and telecommunication service providers. These end users are leveraging the usage of the tools for testing and delivering seamless communication service and in turn, are promoting high-quality services. The increasing penetration of mobile device manufacturers and enterprises in Asia Pacific is promoting the growth of the telecommunication EDA market. China accounted for the majority of the telecommunication market growth, which mainly attributes to an increase in the sale of smartphones. With the surge in the sale of smartphones, the region will witness an increase in the number of mobile internet subscribers, which will positively influence the growth of the industry. Asia Pacific EDA industry is anticipated to witness a high growth owing to the presence of a large number of electronics companies and smartphone users. The growing customer base and the increased penetration in the consumer electronics industry have provided an excellent scope for the growth of the Asia Pacific electronics sector. Also, greater digitization has led to an increased broadband penetration in the countries including China and India and opened up newer avenues for companies in the market. The telecommunication sector accounted for the majority of the market share and is expected to grow at a high CAGR from 2017 to 2024. In addition, the abundant low-cost labor and raw material availability have aided in the growth of electronics and semiconductor manufacturers in the region. 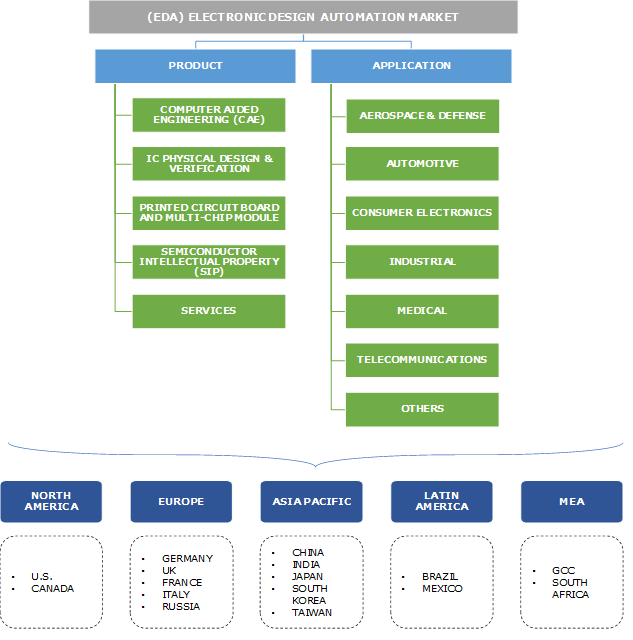 Major players operating in the EDA market are Cadence Design Systems, CadSoft Computer, Intercept Technology, Inc., Invionics, JEDA Technologies, Keysight Technologies, Pulsonix, Sigasi, National Instruments, Silvaco International, Mentor Graphics, Solido Design Automation, Synopsys, Inc., Xilinx, Inc., and Zuken, Inc., among others. Vendors operating in the market are facing intense rivalry with companies competing based on technology, distribution, price, brand, and services. Companies are adopting several strategies such as Mergers & Acquisitions (M&A), partnerships, agreements, and collaborations. For instance, in March 2017, Siemens acquired Mentor Graphics to expand its offerings in the electronic systems and Integrated Circuit (IC) design tool industry. The EDA market ecosystem is highly fragmented and competitive in nature with the presence of several regional and international players. The products and services developed by the companies are being used and implemented across the value chain, allowing various engineering companies in a variety of industries such as aerospace & defense, automotive, consumer electronics, industrial, medical, telecommunications, and others to develop and manufacture secure and smart applications and products. Vendors in the industry are providing pay-per-usage subscription services and models as per the offerings. The market is highly dependent on the semiconductor and electronics industries, which are volatile in nature. Technological advancements coupled with design complexity and the need for effective electronic testing will impact the global industry positively. In addition, developments in the electronics manufacturing processes of semiconductors and expansion of wireless networks in several developing economies will provide ample growth opportunities to the market.